Protomembrana is a mechatronic lesson, in the guise of a performance, featuring a dreskeleton, an interactive audiovisual environment and a range of dynamic interfaces. The storyline of Protomembrana is a theoretical lesson on Systematurgy, which is literally speaking a dramaturgy of computation systems. It is used to weave a narrative full of fables, something like a Roman novel. 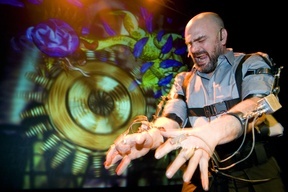 The performance uses, in addition to verbal narration, graphic animation, music and lighting. All these scenic elements are treated as interactive elements which are controlled by means of various interfaces. 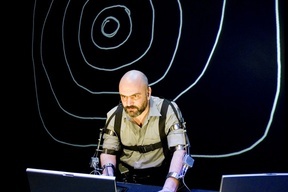 Formally, the action takes place on a large screen, in front of which is Marcel.lí wearing the dreskeleton, and to one side a table with several computers. The narrative is structured in four sections: 1 – Introduction or Martin's Story, 2- The Interfaces or the History of Gesture, 3- Computation or Lucia and the Cat and 4 – The Medium and the five membranes. Apart from images and sound, this interactive story uses other devices such as a camera/gun that captures the faces of volunteers from the audience and inserts them in the performance as protagonists in subsequent animations. Another device is a touch sensitive costume; it consists of four components that are worn by a volunteer, enabling her/him to become a visual and sound interface. At times, the use of these appliances transposes the Protomembrana performance to the sub-genres of hypnosis and magic. This lesson is a continuation of the interactive narration that Marcel.lí commenced in his previous work Transpermia. The spoken word, which was practically inexistent in his previous work, plays an important role in the last module of Transpermia. In Protomembrana, the spoken word is the ongoing protagonist as the interactive scenic polysemy is at the service of verbal narration. Interactive Conference; approximate length 60 minutes. Graphic Assistants: Wahab Zeghlache, Emi Martin, Ana Fernadez de Sevilla Fontanet, Oriol Corbella, Merlí Borrell. Models: Lucia Egaña Rojas, Emi Martin, Perla Mesa, Giulia Mattioli, Adelaida Antúnez, Marcel.lí Antúnez Roca.